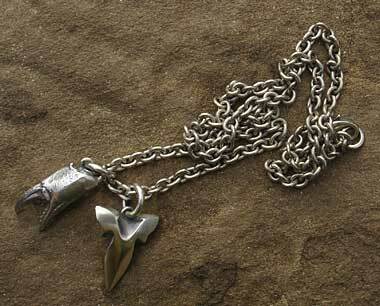 Rock 'N' Roll Claw & Sharks Tooth Necklace : LOVE2HAVE UK! 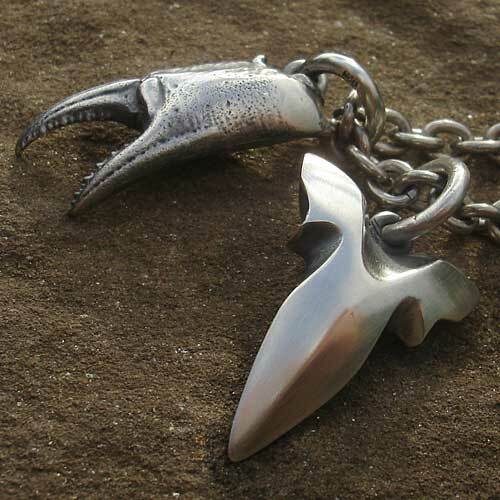 This designer sterling silver and titanium piece of jewellery is a very stylish necklace for men fashioned into a sharks tooth, and claw pendant combination for those that are looking for a real alternative beach look. 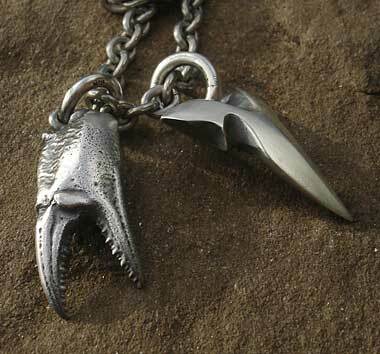 What we have here is a beautifully handcrafted and a unique silver crab or lobster claw with a stylised silver sharks tooth on a titanium chain. It is simply one the finest items of men's jewellery for lovers of the coast and beach activities and its stunning ultra cool design also makes it suitable as a piece of surf jewellery too. This men's necklace is the ultimate choice as an item to wear on your seaside holiday and as you can see from the quite realistic attention to detail will create quite a talking point. The shark's tooth is approximately 25mm high and has a lovely uniform design that features a ridge which as pictured catches the light that then highlights its form. The silver claw again is approximately 25mm high x 12mm wide and is intricately carved. Both have oxidised detail and come threaded with silver jump rings onto a 20-inch long titanium chain (other lengths available) with a secure fastener. The semi oxidised finish we think gives a Rock 'n' Roll look together with the very contemporary styled curves in a silver steel finish. Size(s) Available: 20 inches as standard.